Three out of a series of five dinosaur tracks (two badly eroded) forming a straight trackway on a bedding plane in north-east Wyoming, USA. Millions of dinosaur tracks have been discovered in sedimentary rocks all over the world. Evolutionists have naturally interpreted these tracks within their belief system, assuming they represent normal animal behaviour some one hundred million years ago. On the other hand, the Bible makes it clear that all dinosaurs living at the time, except those on the Ark, perished in Noah’s Flood. At first glance, it seems difficult to explain the formation of dinosaur tracks during the Flood. A closer inspection of the details, however, demonstrates that the Flood is a more reasonable explanation. First, individual trackways (defined as more than one track from the same dinosaur) are, all over the world, almost always straight.1 Normal animal behaviour should often involve meandering tracks, as readily observed by animals making tracks in the snow. Straight trackways indicate that the animals were fearful, as if fleeing from a catastrophe. Researchers recently found forty straight, parallel trackways of two types of large plant-eating dinosaurs in southern England.2 The trackway of a large meat-eating dinosaur was also discovered nearby, going in the same direction.3 These trackways provoked a predator-prey interpretation by the evolutionists. But the tracks could just as easily, if not better, be interpreted as different types of dinosaurs, all fleeing the same event in the same direction. There are few, if any, baby or young juvenile tracks associated with older juvenile and adult dinosaur tracks. 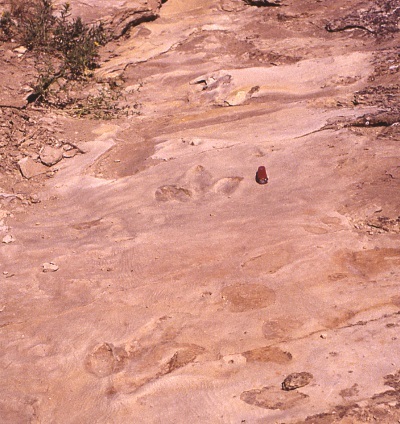 A normal assemblage of tracks should include abundant baby or young juvenile tracks. For instance, 50% of the elephant tracks in Amboseli National Park, Africa, were made by babies or young juveniles.4 Since immature dinosaur tracks are rare, the trackways were probably formed during unusual conditions, rather than by normal animal activity. In the Flood, babies and young juveniles would likely have been left behind, as those more able to flee the approaching Flood waters hastened away. Erosion over even hundreds of years in the evolutionary scheme would have produced at least a hilly topography, exposing several bedding planes. 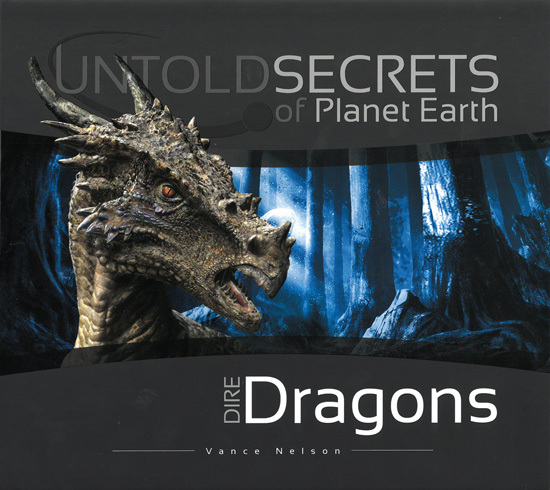 Tracks are found only on flat bedding planes.5 The discovery of the recent track in England just mentioned provides a good example. This favours rapid sedimentation forming flat strata. Erosion over even hundreds of years in the evolutionary scheme would have produced at least a hilly topography, exposing several bedding planes. We should observe trackways on different bedding planes, traversing up hills and down into valleys. These unusual characteristics of dinosaur tracks do not fit well with normal animal behaviour. The evidence agrees better with a time of worldwide stress on dinosaurs. Besides tides, the sea level would have rapidly risen and fallen, due to vertical shifting of the Earth’s crust and strong currents sweeping across the shallow landmasses. The Flood was a complex event; the waters did not smoothly cover all the pre-Flood land and then gently retreat. There were forces at work that would have caused rapid sea-level oscillations during the general rise of the early floodwater. Besides tides, the sea level would have rapidly risen and fallen, due to vertical shifting of the Earth’s crust and strong currents sweeping across the shallow landmasses. Geophysicists John Baumgardner and Daniel Barnette modelled currents on a totally flooded Earth.9 They began with all the water at rest. Within a very short time, the Earth’s rotation would cause strong currents of 40 to 80 m/sec (90 to 180 mph) over the shallowly submerged continents. But most interestingly, they found that in some areas sea level fell by hundreds of metres and intersected the bottom. This pattern moved so slowly that the exposed land would have persisted for many days, but with rapidly fluctuating sea level at the edges. When were dino tracks formed? We see, once again, how what seems like an ‘insoluble problem’ for the Biblical history of the world is resolved by a ‘closer look.’ Rather, we quickly discover that the tracks are a significant problem for the evolutionary interpretation. Not only that, but, once we put on ‘Bible glasses,’ the facts about dinosaur tracks are seen to be consistent with this real history, and thus are strong evidence in its support. What about tracks on multiple bedding planes in a local area? In this formation, over 100 dinosaur trackways have been discovered on numerous different thin bedding planes in a strata sequence 100 to 200 m thick. Dinosaur track expert Martin Lockley explains the occurrence of dinosaur tracks as representing ‘ … groups or herds of subadults and adults passing through the region on purposeful local or long-distance migrations (that is, not milling around or browsing locally).’ 2 Can the Flood explain such a vertical sequence of tracks? Actually, it is not too difficult. As the main text explains, the Flood involved oscillating sea levels. In some places, this would have forced dinosaurs to move back and forth on the exposed land. A thin layer of sediment would have been laid during each rise, and the dinosaurs would have walked back over the same area during each fall of sea level. In the case of the Jindong Formation, one could expect that the exposed land would have been quite small, so that the dinosaurs would have walked over the same area, i.e. containing previously-made tracks. A similar sequence is suggested for multiple egg horizons, which occur on far fewer horizons than tracks in a local area. There is substantial evidence favouring the Flood interpretation over Lockley’s. Within the evolutionary worldview, a sequence of dinosaur tracks made in strata 100 to 200 m thick would be expected to have been laid down over a long period of time, perhaps several million years. This being the case, one would expect many types of dinosaur tracks. Actually, the tracks on all these many bedding planes are similar on each horizon, and Lockley deduces they are from one species of dinosaur. This would be a nigh-impossible occurrence within the evolutionary scenario, but expected within the Flood model. Lockley, M.G., Dinosaur ontogeny and population structure: interpretations and speculations based on fossil footprints; in: Carpenter, K., Hirsch, K.F. and Horner, J.R. (Eds. 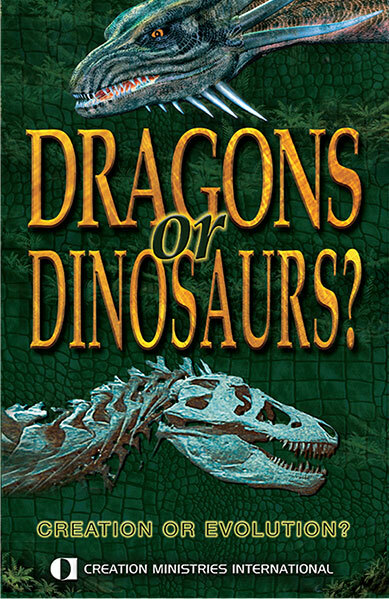 ), Dinosaur Eggs and Babies, Cambridge University Press, London, pp. 347–365, 1994. Return to text. Ref. 1, p. 352. Return to text. Lockley, M. and Hunt, A.P., Dinosaur Tracks and Other Fossil Footprints of the Western United States, Columbia University Press, New York, p. 165, 1995. Return to text. Day, J.J., Upchurch, P., Norman, D.B., Gale, A.S. and Powell, H.P., Sauropod trackways, evolution, and behaviour, Science 296(5573):1659, 2002. Return to text. Researchers find impressions of dino life, cnn.com, 31 May 2002. Return to text. Lockley, M.G., Dinosaur ontogeny and population structure: interpretations and speculations based on fossil footprints; in: Carpenter, K., Hirsch, K.F. and Horner, J.R. (Eds. ), Dinosaur Eggs and Babies, Cambridge University Press, London, p. 359, 1994. Return to text. Lockley, M., Tracking Dinosaurs—a New Look at an Ancient World, Cambridge University Press, London, pp. 136–138, 1991. Return to text. Genesis 7:22. Return to text. Oard, M.J., Where is the Flood/post-Flood boundary in the rock record? J. Creation 10(2):258–278, 1996. Return to text. Walker, T.B., A Biblical geological model; in: Walsh, R.E. (Ed. ), Proceedings of the Third international Conference on Creationism, Technical Symposium Sessions, Creation Science Fellowship, Pittsburgh, Pennsylvania, pp. 581–592, 1994; Oard, M.J. and Klevberg, P., A diluvial interpretation of the Cypress Hills Formation, Flaxville gravel, and related deposits; in: Walsh, R.E. (Ed. 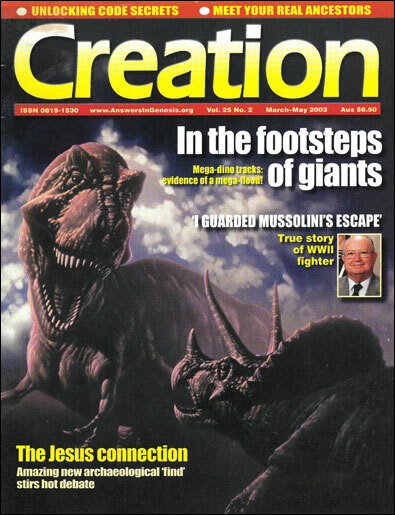 ), Proceedings of the Fourth international Conference on Creationism, Technical Symposium Sessions, Creation Science Fellowship, Pittsburgh, Pennsylvania, pp. 421–436, 1998; Oard, M.J., Vertical tectonics and the drainage of Floodwater: a model for the middle and late diluvial period—part I, Creation Research Society Quarterly 38(1):3–17, 2001. Return to text. Barnette, D.W. and Baumgardner, J.R., Patterns of ocean circulation over the continents during Noah’s Flood; in: Walsh, R.E. (Ed. ), Proceedings of the Third international Conference on Creationism, Technical Symposium Sessions, Creation Science Fellowship, Pittsburgh, Pennsylvania, pp. 77–86, 1994. Return to text. Oard, M.J., The extinction of the dinosaurs, J. 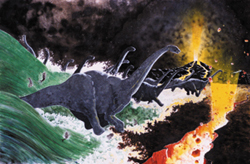 Creation 11(2):137–154, 1997; Oard, M.J., Dinosaurs in the Flood: a response, Journal of Creation 12(1):69–86, 1998. Return to text. Dinosaur tracks discovered in Queensland needed to be covered after excavation because they were eroding through exposure to the elements. So they couldn’t have been exposed for millions of years. See: Moves afoot to protect our outback dinosaur attraction, tq.com.au, 4 December 2002. Return to text.